James 1:12 There is a reward! Author LCPublished on October 26, 2011 Leave a comment on James 1:12 There is a reward! I have come to realize that a major theme in James 1 is humility. James 1:12 tells us that we will be rewarded if we endure the testing that we face. What must we do to endure testing? We need to let go of our pride and our feelings of entitlement. How do you react when you face trials? I have to admit that I usually try to avoid them. I think it is quite common for people to pity themselves and want to escape the unpleasant circumstances that they are in. But the Bible tells us that we face testing to humble us, to strengthen us and to bring good to us. (Deuteronomy 8:16, James 1:2-4) A wise pastor once suggested that instead of lamenting our trials that we ask God what He wants us to learn from them. Candy Hemphill Christmas, founder of The Bridge Ministry has said that she has learned something about God—“that if you ask Him a question, He will answer. Now, you’re going to have to get ready for the answer, but He will answer. It might not be what you want to hear, but He will answer.” Are we willing to submit to God’s answer, to His plan? That takes humility. I wonder what would happen if we thanked God for our trials and looked for the lessons in them rather than complaining about our lot in life. Let’s try to focus on making the best of the present instead of wishing for something better in the future. Let’s see how we can help other people instead of throwing ourselves a pity party. Let’s trust God to bring good out of every circumstance in our lives. Published on October 26, 2011 Categories Hope, TrialsTags God, hope, humility, James, Job, pride, testing, trials, trustLeave a comment on James 1:12 There is a reward! Romans 1:18-20 Does God exist? Author LCPublished on June 22, 2011 Leave a comment on Romans 1:18-20 Does God exist? I was just outside enjoying the first full day of summer. 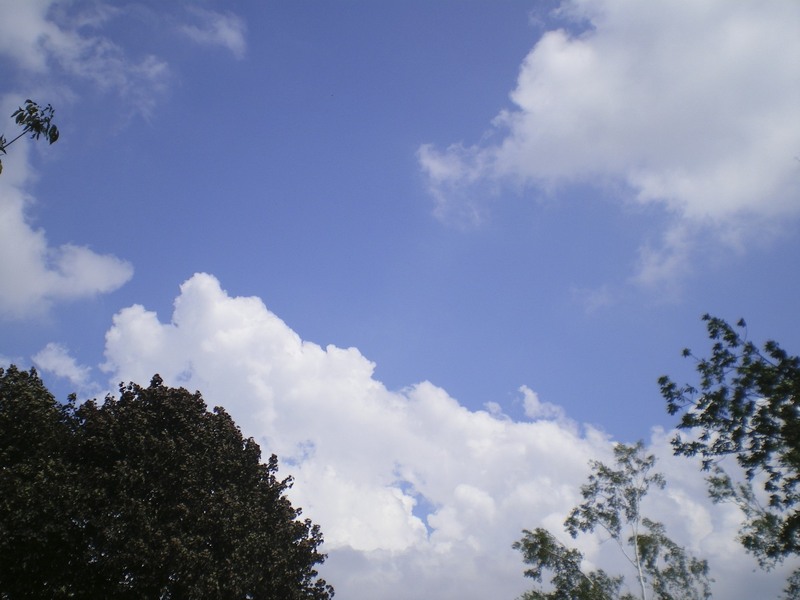 It’s a warm day here in Southern Ontario, Canada, and the sky is blue with a few bright white, billowing clouds lazily drifting by. As I walked across the lush green grass, a robin, who apparently would rather run or hop than fly, skittered away from me. A goldfinch flew from the birdfeeder to the safety of the nearby cedar branches. High above me the breeze rustled the leaves of a large ash tree. The dark pink peonies that were in full bloom yesterday appear a little more beaten down today, a result of last night’s thunderstorm. I’m sure some would have enjoyed the majesty of all that thunder and lightning a little more if they hadn’t been trying to sleep at the time. How can people witness all of these marvelous facets of creation and still try to convince themselves that there is no God? I believe that they are trying to avoid being held accountable to the One who created them. As I said in my last post, (June 20, 2011), God is holy, and because He is holy, He cannot tolerate sin. The only way that people know how to avoid being accountable to God is to pretend that He doesn’t exist. This reminds me of students who don’t look at a teacher when she is asking a question. They must be thinking, if I don’t look at her, she won’t see me, and won’t ask me to answer. God sees us whether we are willing to acknowledge Him or not, and we are accountable to Him, whether we are willing to admit it or not. Just because you don’t want to believe something, doesn’t mean it isn’t true. Romans 1:18-20 tells us that God’s wrath is revealed against the unrighteousness of those who suppress the truth, and that what can be known about God can be clearly seen in His creation. We know from Deuteronomy 29:29 that there are some things that are known only to God, but what we can know has been revealed to us so that we will want to honour and obey Him. God has made all of humankind to understand that creation requires a Creator. The intricacies of this life, the human body, plants, animals, the rotation of the planets in the universe, they didn’t just happen. They follow a design that requires a Designer. We can try to convince ourselves that God doesn’t exist, but it won’t work. The evidence is all around us. Published on June 22, 2011 Categories God's PowerTags creation, evidence, existence, God, RomansLeave a comment on Romans 1:18-20 Does God exist? Something I said in my last blog post (John 1:14, January 7) inspired me to look up Colossians 3:23-24. My question from the passage in John was how would it change your life if Jesus moved in next door? Colossians 3:23 tells us that it doesn’t matter what we are doing, or what human person asked us to do it, we are really working for God. From the previous verse we see that this passage refers to slaves working for their masters, but in today’s context the principle would apply just as well to employees, children and students. How do you react when your boss asks you to do something that isn’t technically in your job description, or you feel is beneath you? What is a child’s usual response when asked to clean his room? What about students who let other members of the group carry the load on a group project? Would it make a difference if Jesus had asked you to do it? It’s true; your boss’ motives may not be as pure, selfless and forward-thinking as Jesus’ are, but her authority still needs to be respected. Verse 23 also tells us to work with enthusiasm. The King James version uses the term heartily; the original Greek means from the soul. Now think about this for a minute. When you are doing the dishes or the laundry or taking out the trash, are you doing it with enthusiasm? These are not the most glamourous tasks, but they deserve the best of your ability. They may seem like thankless jobs, because there’s a good chance that no one ever says thank you for doing them, but the Lord will reward you. When you are working for Him, what others think won’t matter to you. You may not get a raise or promotion by working those overtime hours when your boss asks you to at the last minute. You may not get an A on that group assignment, or a bonus in your allowance for cleaning up your room. Earthly rewards are not always fair or reliable. Sometimes you get praise for what others have done, and sometimes you don’t get the praise you deserve. Sometimes it seems like your efforts are quickly forgotten. God doesn’t forget. Your reward from God will not be based on the amount of talent you have, or how popular you are, or how much money you earned. The reward He gives you will be for your attitude and your faithfulness. Did you give God your very best effort? Jesus will be doing your final performance review; are you ready?